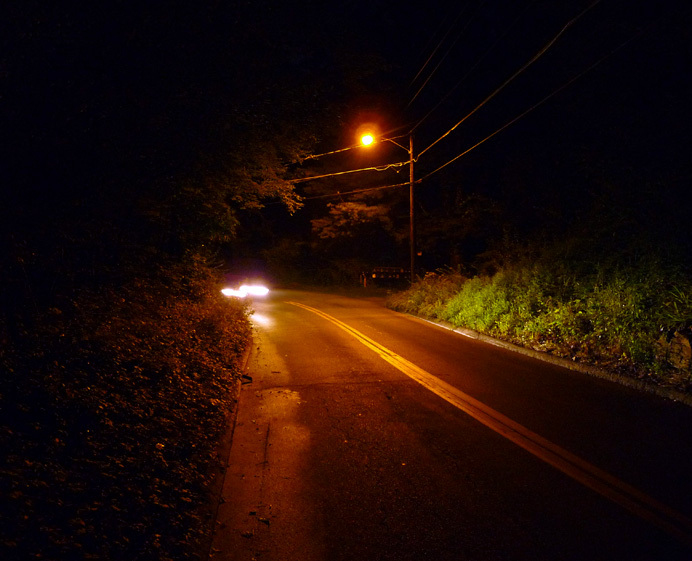 One reason I seldom walk my 3.5-mile circuit at night anymore is this blind S curve on Middle River Road, nearly an hour into the trek. Today I was unable to begin until sunset, which put me in the middle of the curve in darkness as these headlights approached. Although I'm confident I can leap out of the way in time, suddenly seeing me as they round the curve scares the hell out of motorists. (Over the years, a few have stopped to berate me. "Hey," I told one, wagging a finger through his open window, "I pay taxes, too—and why were you going fifty in a twenty-five zone?") In this case, the headlights swerved just as I tensed for my exit move, a horn blew, I wheeled and delivered a customary gesture, and then we both went on our way. . It's unanimous. Everyone chose July 10: "Most Wonderful Hour of the Year." (That's my favorite, too.) Thanks to all who participated, and please vote again next month.